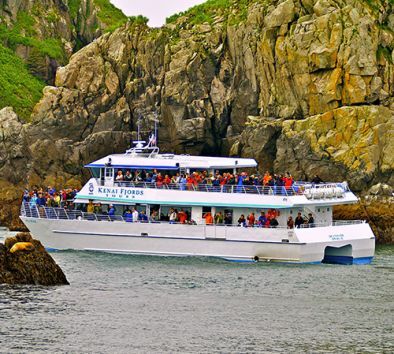 Spend a day cruising the unspoiled wonders of Kenai Fjords National Park. The narrated tour begins when your vessel ventures out from Seward to Resurrection Bay. Then, you’ll head out to the open waters of the Gulf of Alaska around Cape Aialik to the face of a tidewater glacier. As you marvel at the serene surroundings, listen for the thunder of “calving”—a process by which glaciers shed giant blocks and slabs of ancient ice and send it crashing into the still waters of this protected bay. Watch for a variety of marine life such as humpback whales, orcas, seabirds, sea lions, and otters. A complimentary lunch is served as you keep track of your route on flat-screen monitors. Bring your camera and binoculars. Dress in warm layers so you can spend time on the deck. This cruise will spend some time in open waters. If you think you may be susceptible to motion sickness, we recommend taking motion sickness medication the night prior to alleviate discomfort so that you can enjoy your sailing. Travel time is approximately 2 hours each way.